Replacing miners and block producers with smart contracts. Smart Blockchain is the new generation of Blockchain networks that will allow one or more smart contracts to collect accurate and flawless data from the successful transactions of a decentralized network at the moment of transaction occurrence, and simultaneously storing and registering these data in new blocks. Smart Blockchain needs neither the financial institution nor intermediary, in addition, there will be no task to do for miners and block producers in this technology. In other words, within Smart Blockchain, always one or more smart contracts like a financial institution, free of charge and automatically record and store transactions ‘data in new blocks. The authors of the article are Ms. Somayyeh Gholami and Mr. Mehran Kazeminia and it is written in Persian and English versions in April 2019. How does Smart Blockchain work? 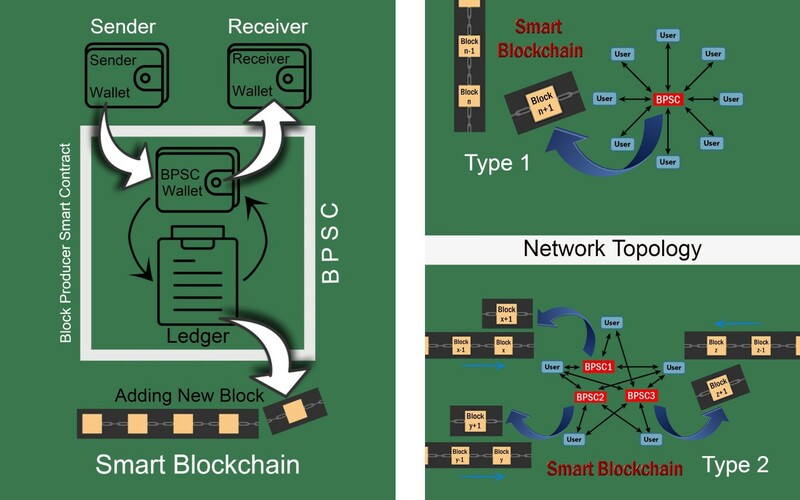 In Smart Blockchain, one or more Block Producer Smart Contract (BPSC) is present in the decentralized network, and no successful transaction is performed without BPSC involvement. For a successful transaction in the network, first, the sender must send the cryptocurrency to the wallet of BPSC and then BPSC sends cryptocurrency automatically to the receiver. 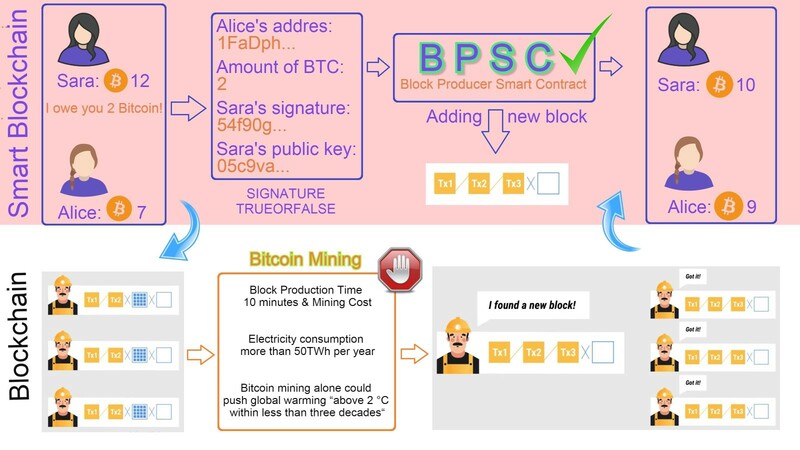 This simple action has led the BPSC to have all network transactions’ data accurately and flawlessly and then as an accurate and trust financial institution, record transactions’ data into a new block and add this new block to the end of the blockchain and so there will be no tasks to assign to miners and block producers. What are the benefits of Smart Blockchain? At the moment of transactions occurrence, the correct and flawless data of transactions are stored and registered. In this case, there is no need to generate some alternatives from a block like what they do in Bitcoin network, Ethereum network, etc., and then the miners choose the correct and valid block by spending so much money, consuming huge power electricity and using a variety of proof mechanisms. Staggering power consumption is the result of the use of the proof-of-work mechanism or the proof-of-stake mechanism, or….. Which Smart Blockchain does not require any of them at all. Unfortunately, the electricity consumption of one single bitcoin’s transaction is 200,000 times more than electricity consumption of a one single VISA’s transaction. The annual electricity consumption used to store and register the entire Bitcoin’s transactions is more than 50 terawatts (1 TWh = 3 600 000 000 000 000 J) that is equal to the annual power consumption of a country with ten million populations. The study was published in October 2018 on global climate change, which showed that in less than three decades, Bitcoin mining could increase global temperatures more than 2 degrees Celsius. Fortunately, Smart Blockchain transactions and regular Visa Card transactions won’t differ on power consumption. The data stored by the BPSC is flawless because it is registered at the moment of the transaction occurrence automatically and without human interference. Smart Blockchain simply can end the nightmare of spending extra tens TWh electricity. 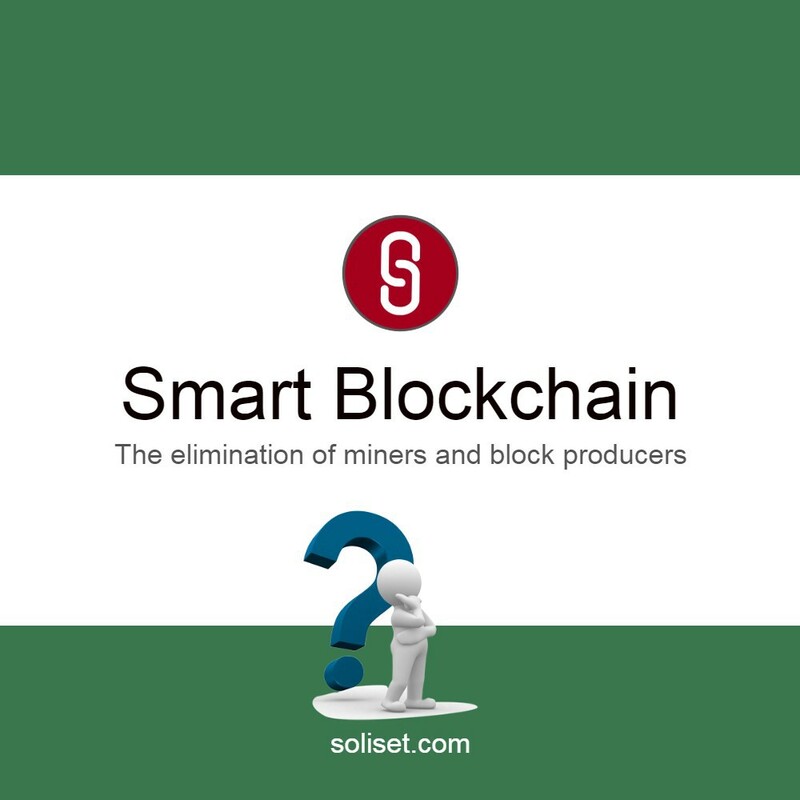 What is the use of Smart Blockchain? First use: In networks like Ethereum, EOS, etc. which is possible to register and deploy the smart contracts, simply we can set up a dedicated blockchain for each new smart contract. In this way, as soon as the new smart contract is launched, a BPSC will be launched, and from the very beginning, all of the transactions of a smart contract will be stored and registered into the BPSC’s ledger. In this case, the dedicated blockchain will not need any data from Ethereum blockchain, EOS, etc., and it will work independently. Meanwhile, at coding, this BPSC can be coded and launched separately, or BPSC codes can be imported into the desired smart contract codes. Second use: For each Ethereum networks, EOS, and etc. that allow registering and deploying the smart contracts, the whole existing Blockchains can be replaced with Smart Blockchain. To do this, after launching a dedicated BPSC into the network, the precise and final status of all existing wallet is to be made available to the BPSC, Also thereafter all the subsequent network transactions will be done via BPSC. Third use: If we want to use Smart Blockchain for networks such as Bitcoin which is not possible to set up any smart contract, we should first launch a new decentralized network that allows registration and deployment of smart contracts like the Ethereum network. 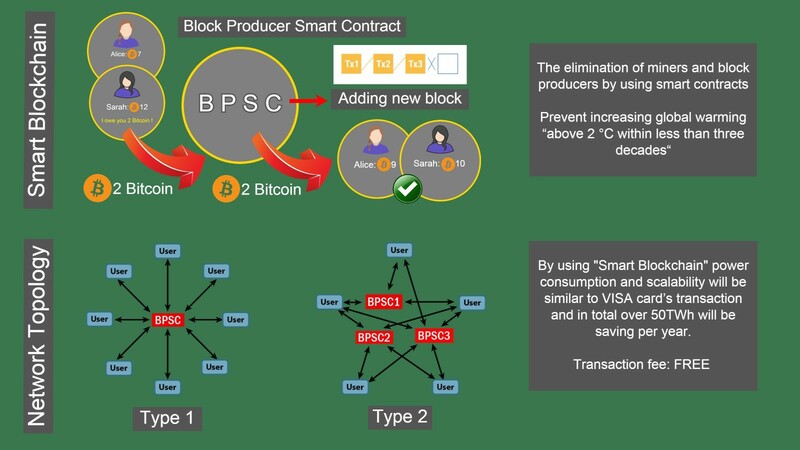 Then, in this new network, we design and activate a block producer smart contract BPSC. After assuring of the functionality of BPSC on the new network, we must ask all Bitcoin owners to get the equivalent of their bitcoin, from the new Blockchain’s cryptocurrency, and at the same time, their initial bitcoin should be burned. These are done by the BPSC of a network, and the BPSC can record the initial balance of any wallet in the network and begin its work immediately. In the first stage, by registering and deploying a smart contract, we create one million AKA Token of the ERC20 type at once and all tokens will be in the wallet of the contract (AKA wallet). In this example, we want to set up a new blockchain to record transactions of these one million AKA Tokens. The new smart blockchain is completely independent and does not require main Ethereum’s blockchain data. It means that if the Ethereum blockchain was stopped for any reason, for example, the miners and block producers stopped working; the new Smart Blockchain will continue to work. AKA Tokens can be sent from the wallet of the senders only to the wallet of BPSC, and the BPSC will instantaneously send the token to the original receiver. By this simple method, BPSC, in the role of an accurate and trusted financial institution, will have transactions’ data. For data of each successful transaction, the BPSC ledger will be updated immediately. 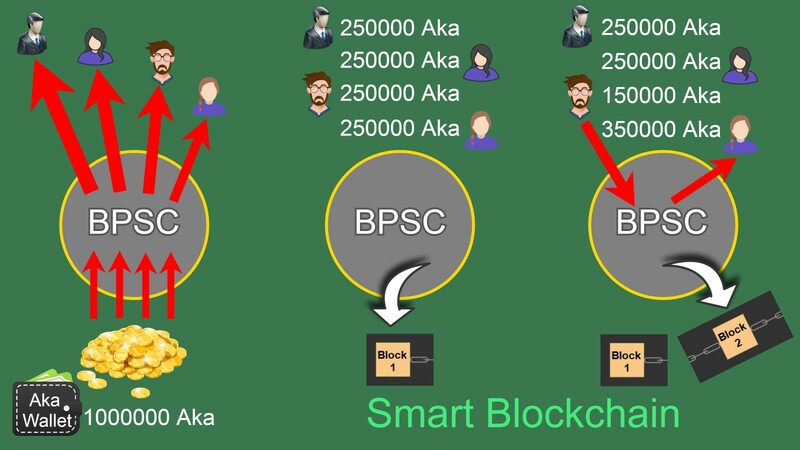 At the desired time interval, the BPSC adds new transactions’ data to the end of the chain as a new block. Assume that all AKA tokens are purchased by four persons in equal numbers. So you need to send two hundred fifty thousand AKA Token to each buyer. Of course, for doing this, first, the AKA tokens should be sent to the wallet of BPSC and BPSC will immediately send them to the wallet of the buyers. Now the BPSC can update its entire ledger and record the data of these transactions in the first block. 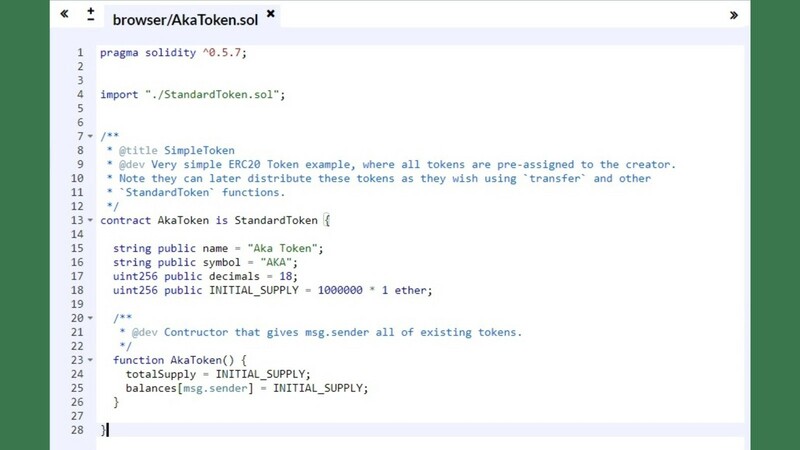 In continuation, if one of the owners of Aka Token, for example, sells 100,000 Aka Tokens to another, the seller will still send the 100,000 Aka Token to BPSC and BPSC immediately sends Aka Tokens to the buyer. Anyway, no transaction is considered as a successful transaction without BPSC involvement, which is why BPSC can continuously update its ledger and record transactions’ data in the new blocks.